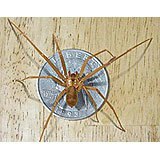 Perhaps the most feared spider in the United States (outside the black widow) is the brown recluse spider (Loxosceles reclusa). The brown recluse is also known as the fiddleback spider, violin spider, or brown fiddler. Frankly, I don’t give a crap what you call them. They’re ishy and should probably just die. As a bio geek, I know I shouldn’t say that, but darn, have you seen the bite these things can inflict (look below)? Brown recluse venom is hemolytic (breaks down blood cells) and cytotoxic (destroys or harms living cells). When these powers combine, you do not get Captain Planet. Nope, you get something called necrotic venom. Way less fun. What that means is that some (not all) brown recluse bites leave lesions of dead and dying skin and tissue. That said, I now have to defend them a bit. It turns out many brown recluse bites give you nothing more than some pain and a little red mark that will go away without causing any real damage. Getting bitten by one is actually pretty rare. Brown recluse spiders are generally non-aggressive and spend most of their time in hiding, waiting for small bugs to feast upon. If you do have a spider bite, it’s probably from something else. Brown recluse are found primarily in the central Midwestern states down to the Gulf. Don’t get me wrong—if you live in that area, there are tons of them around. If you’re outside of that area, chances are slim. Not impossible, but slim. Ranges have a tendency to expand, especially with a warming climate and travel (they like to hitch rides in suitcases). 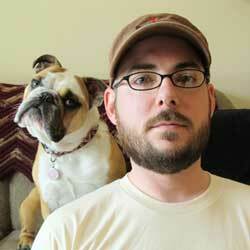 I’m not trying to turn these guys into cuddly puppies. They’re dangerous little mofos, especially for (but not limited to) the elderly, the very young, and people with immune systems that aren’t up to par. If you think you’ve been bitten by a brown recluse, get to the hospital. Better safe than sorry. If you’re just looking for some advice on keeping them out of your house and away from your skin, keep reading. Three pairs of eyes (one set facing forward and one set on either side of the head), a violin shape on the back, uniformly light colored legs without spines. Brown recluse bites can cause: severe pain at bite site after several hours, red color around bite, nausea, muscle pain, vomiting, severe itching, blistering, and necrosis (death) of skin. Close off access to your home. 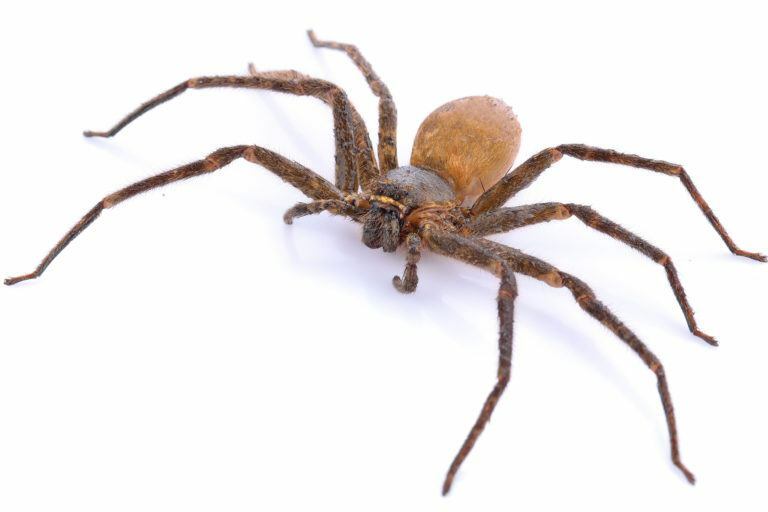 Although it’s impossible to stop all brown recluse spiders from entering your house, you can certainly slow them down. Start by slowly walking the perimeter of your house with a caulking gun. Fill any little crack in the foundation you can find. Also, fill any little gaps around wires, cables, conduits, faucets, or pipes that you can see. When the outside is done, go into the basement and do the same. Be careful doing this, as you might spook some of them out of hiding. Do not inadvertently lure them closer. Brown recluse spiders are suckers for shelter. Clear away any plants that are growing next to your house, especially ivy. Cut them back as far as you are willing, I recommend at least twelve inches, but the farther the better. If you have any rock piles, wood piles, or any other debris that spiders could hide under, move them (very carefully) as far away from your house as possible. Do your best to avoid outdoor lighting, too. Lights attract thousands of delicious bugs. If you must have outdoor lights, go with yellow. Brown recluse spiders don’t really want to bite you, but they will if you make them feel threatened. A good way to do this is to stick your nasty foot right in its face while it’s trying to hide in your shoe. They would also appreciate it if you didn’t try to wear the piece of clothing they were trying to nap in. 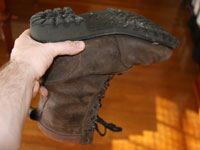 So, be sure to shake out your boots, shoes, and any other article of clothing you intend to wear before putting it on. Brown recluse spiders also like to hide in your bed. Make sure to thoroughly check your bedding before crawling in. To help keep them from getting in your bed to begin with, move it a few inches away from the wall. Don’t snug it up against drapes, don’t use a bed skirt, and don’t let your sheets or blankets dangle to the floor. This is particularly important if you make a habit of storing your unused items in cardboard boxes. Boxes are great little brown recluse hotels. These spiders like living in and around wood and can’t tell the difference between it and cardboard. If you’re gonna use boxes, tape them up really well with packing tape before putting them in storage. This means all edges and any openings. 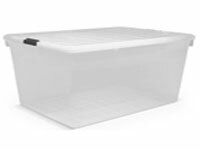 If you’re not stuck on your boxes, I strongly recommend using rubber or tin/metal containers with tight-fitting lids, like the Rubbermaid Storage Totes you can get at Amazon. Also, keep seasonal clothing and extra sheets and blankets in sealed plastic bags. If it’s on the floor and it shouldn’t be there, pick it up. This includes any stacks of magazines, newspapers, paperwork, movies, CDs, and anything else that looks like something a brown recluse could hide in or under. This is especially true of clothing piles. Put your clean clothes away immediately. Also, don’t just throw your dirty clothes on the floor. Put them in a well-enclosed hamper. When you’re done picking things up, make sure there are no leaks anywhere. Brown recluses need water. Fix any drippy faucets or leaky pipes. I know you don’t want to hear this, but if you’ve seen one brown recluse spider, you can bet the farm there’s more. The best way for you to figure out the extent of the problem is to go hunting. Brown recluse spiders are nocturnal, so you probably won’t see them during the day. Turn the lights out, wait for a couple hours after dark, put on some gloves, grab a flashlight, and let the hunt begin. Search your house for the little nasties. Shine your light down in closets, along baseboards, behind furniture, in the cupboards under the counter, and anywhere else that looks protected. The main reason for the hunt is so that you will know the best places to apply pesticides. Once you have figured out the main problem spots, apply the treatment. There are quite a few pesticides that kill brown recluse spiders. Look for products containing cypermethrin such as Cynoff EC,Cynoff WP, Demon WP, or CB Air Devil HPX (aerosol). Pyrethrins are good, too. Look for Drione Dust or 565 Plus XLO. Products containing deltamethrin, like Delta Dust and Suspend SC, are also quite effective. Spectracide Triazicide with the active ingredient lambda-cyhalothrin is great for outdoor (perimeter) use. With any and all of these, don’t be dumb. Make sure you read all directions and precautions. 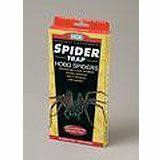 Besides killing brown recluse spiders, the pesticides I’ve listed work great for a wide variety of pests (yay!). One last thing: never be shy about seeking help. There’s no question that these spiders can be dangerous. Exterminators are full of experience. They know how to keep themselves safe while making your home safe for you. Do yourself a favor and grab the phone book, look up exterminators, and at least get an estimate. It’s probably more reasonable than you would think. Hedge balls; also known as horse apples, osage orange, and, my personal favorite, monkey balls; are commonly used as brown recluse repellents. 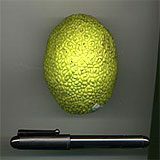 Place several of these balls against the walls around your home. They can last for up to three months. Eucalyptus, available at most craft shops, is supposedly a good natural brown recluse repellent. Many folks swear that by scattering some branches around the house and in window sills you will reduce the number of spiders in your home. Spider traps are a pesticide-free method of controlling brown recluse spiders in your home. Very simple. Spider sees it, is too stupid to avoid it, steps on it, gets stuck to it, and dies on it. Not a very dignified death. Oh well. Dignified or not, Amazon sells these Brown Recluse spider traps that you may want to try.